Whether you already have a Property or Construction-based role in the Armed Forces and are looking to progress your career or you’re planning for resettlement in a Built Environment profession, one of our qualifications can help you work towards your goals. Delivered through supported online education, our programmes are taught by a team of academics and industry practitioners, many of whom are prominent experts in their field, and can be studied wherever you are in the world, via an internet connection. What happens if I’m posted abroad? All our programmes are delivered via supported online education. Our online learning platform, the Virtual Learning Environment (VLE) is your central resource for week-by-week module planning, e-library, study support materials and module discussion forums to help you achieve your learning outcomes. As you progress, material for each module will be made available on the VLE and supplemented where necessary with e-books. With our programmes you can study anywhere in the world, as long as you have a computer and internet access. If you’re posted somewhere without reliable internet access then you can discuss your study options with our Student Advice team. Our VLE is a worldwide virtual community, where you can join your fellow students and tutors in discussion forums. Here you can also access Student Central, where you are able to raise queries with us and access frequently asked questions by other students. Your studies are supported by a number of teams working to ensure that you are able to access the support you might need to complete your studies. Where would I sit my exams? UCEM provides approved examination centres worldwide. All students are allocated an examination centre based on the location of your listed home address and country of residence. It is important to be aware that whilst UCEM will strive to provide a convenient examination centre based on your location, it is not always possible to provide a centre within your immediate local area. Where a student of the armed forces receives notification of deployment, UCEM will work together with the student to seek to arrange a suitable examination centre at an appropriate Military Base or similar. Any requirements to arrange an examination centre at a Military Base or similar are subject to suitable means of invigilation in the capacity of an officer or HR representative and adherence to UCEM examination guidelines. We are an approved provider (1322) for the Ministry of Defence Enhanced Learning Credit Scheme (ELCAS) for armed forces personnel and all our programmes are available under this scheme. If you are a current or former member of the UK armed forces then you may be eligible for ELCAS funding. Please check their website for full details or contact your Education Officer. If your application to study with us is accepted, please contact the Finance team for information on how to register with your ELCAS funding. 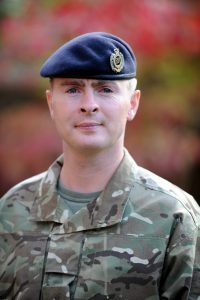 Flexibility and support was key for me as being in the Army I get deployed regularly; whilst studying towards my degree I spent six months in Afghanistan and three months in Kenya. During these deployments I could not have wished for better support from the tutors and support staff. Throughout my time with UCEM all the tutors were supportive and helpful; where individuals struggled they would make the time to help. The Virtual Learning Environment which allows all students and tutors to discuss topics within the modules is invaluable and one of the best features of the online package.